JM Thank you for having me. I’m very excited to be here. Well, I recently published my first book … a MagBook, titled Labyrinth’s Door – Anyia “Dream of a Warrior” and I’m currently finishing up my first fantasy/adventure coloring book Talee and the Fallen Object which I’m really excited about. JM Um … I like to write in my head. I like to sit and think about the story, play around with it in my head and if it works I will begin the task of putting it on paper. I don’t know if everyone does that but it seems to work for me. JM I don’t know if I do consider myself a writer … not a conventional writer anyway. I see myself as a storyteller that writes. And I think I realized that a couple of years ago when a desire to have stories to read to my daughter collided with a desire to direct fantasy/adventure movies. JM I write fantasy/adventure stories. Right now I’m focused on stories for children but looking to also publish some YA (young adult) novels in the near future. I have a couple of story ideas I’ve started working on. JM Disney at a very early age, although I didn’t realize it until I had the desire to start writing. I would also have to say, the cartoon version of Avatar – The Last Airbender, Avatar the movie by James Cameron and of course the Harry Potter Series all have some impact on me in some form. And oh, don’t let me forget to mention Star Trek. I love to watch Star Trek, which I think also, has some influence on my desire to write fantasy/adventure stories. JM They love it. I think my kids are my biggest fans. JM I didn’t expect that the story and characters would take on a life of their own, and that I would be so curious about what’s going to happen next. When I finished Anyia “Dream of a Warrior” I sent the book out to a couple of friends to see what they thought and one of my friends phoned to talk to me about the book after she had read it. I remember talking to her about the characters and story and she was telling me how she really liked it and then she asked me what was going to happen next… I sat on the phone in pause for a moment and said I don’t’ know … I’m curious to know as well. So, although I think I know where the stories are going, my outlines are just rough points to hit, the stories really develop as I go. I just make sure I know the theme and the arcs and go from there. K.S. What inspired you to write? JM One of the reasons I started to write came from a desire to read fantasy/adventure stories to my daughter when she was younger. When my daughter was younger I use to read to her every night and I was looking for a fantasy/adventure story to read to her and got frustrated when I didn’t find what I was looking for. It was during that time that I realized I had them in my head. K.S. Can you tell us a little about Labyrinth’s Door – Anyia “Dream of a Warrior”? 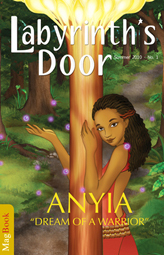 In the first edition of Labyrinth’s Door, Anyia, a young Nagoran girl, whose dream of becoming a Nagoran Warrior is infused with adventure and danger. Running from her duties as a Yora, she dares to break tradition to follow her own dream, during a time when Empress Zarina threatens the magic treaty that protects her village. Giggling, Anyia walked down the worn path in her red and gold royal dress as Pepo bugs, ancient animals of the Nagoran Forest, flew around her. “Doesn’t it feel like a day for great things to happen?” said Anyia. It wasn’t her usual morning walk, but today was the day she had been waiting for. For months, through the land of Ethonia down to the Nagoran Village, there had been gossip about Amoonda, a female warrior—the only female to ever be named a warrior for the courage she showed as she helped to forge the treaty of lands. The rumors said she would be passing through the forest to meet with the Treelins on this day. Anyia was excited. Her dream was to become a warrior like Amoonda and bring honor to her village. It didn’t matter to her that females were forbidden to fight in battle. Anyia thought that following old traditions was mindless. If females were allowed to become warriors, they could help protect and bring honor to the Nagoran Village just like the males. Anyia followed the Pepo bugs through the forest until she saw the tree she was looking for—tall, with lush golden-leaved branches that reached up to the sky. “There it is,” she said, excited. “An Erow tree.” Eyes wide, she ran up to the lean tree and rubbed its trunk, the bark smooth under her hands. The soft scent of the leaves filled her nose and she smiled, looking up, softly tapping the tree trunk with the palm of her hand. The Pepo bugs flew into the canopy. Anyia smiled. Looking up at the canopy, Anyia watched the Pepo bugs fly through the many layers of golden leaves, bouncing along, sending up puffs of dust. A loud screech made her turn quickly. The Pepo bugs flew down from the canopy and, one at a time, their purple glows turned bright red. “It’ll be all right,” said Anyia. She knew that Pepo bugs turning red meant danger was near; being outside the boundaries of the village could be perilous, but she had to find Amoonda. When the loud screech sounded again, she ran toward it, her curiosity piqued. The Pepo bugs followed as she ran off the worn path, up the hill toward the edge of the forest. At first all she could see was tall grass, but when she reached the top, she gasped. It’s on my website http://www.WorldsToDiscover.com as well as Amazon.com. I have them all. My website is: http://www.WorldsToDiscover.com. You can also find me on Facebook, Twitter and my blog The Journey of a Storyteller. K.S. Do you have any closing advice to aspiring writers? Yes, write what inspires you. It will get you through the tough times.